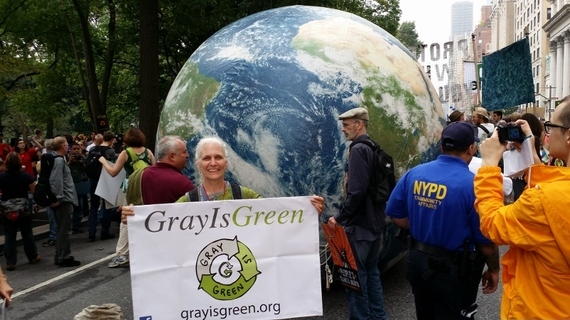 Kathleen Schomaker of Gray is Green at the People's Climate March in New York City in September 2014: "Elders need to see ourselves as ancestors with a call to action on behalf of the future." Elders around the world may be our best hope for solving the "super wicked" problem of climate change. Short-term thinking created our current climate predicament. Despite warnings and predictions from the scientific community, the developed world spewed greenhouse gases into the atmosphere. Given that problems, solutions, costs, and benefits play out over time frames spanning generations, the situation calls for intergenerational climate-change activism. Why would seniors enlist in the crusade? They have a long view due to the number of years they have already lived, during which many have witnessed changes in the climate. Many also have passion to protect their children and grandchildren. Halfdan Wiik of Norwegian Grandparents Climate Campaign says, "For me, it's all about love and optimism. Elders of today have lived our lives in a world of great changes, for good and for bad. We know it can be changed once more." Elders often work with a sense of urgency, realizing that they may have relatively few years left in which to leave their legacy. And generally speaking -- and with countless exceptions -- compared with younger people, elders often have more free time, financial resources, wisdom, experience, economic and political clout, sense of connection to nature, and freedom from worries about job security, mortgages, and dependents. In the 1960s and early '70s, many of today's elders successfully demanded an end to the Vietnam War, expanded the civil rights movement, and created the modern environmental movement. From these experiences, they learned how to create change. Environmentalist Bill McKibben calls on baby boomers (people born between 1946 and 1964) to rally once again. "Now is the boomers' chance to reclaim their better, bolder natures and to end their run as it began," he writes. Baby boomers began reaching retirement age in 2011. Retired boomers represent a huge, untapped resource that grows by 10,000 people every day in the U.S. alone. Baby boomers wield enormous power, constituting 36 percent of the U.S. electorate and accounting for half of all U.S. consumer spending. Ron Pevny, director of the Center for Conscious Eldering and author of Conscious Living, Conscious Aging, highlights not only the growing demographics but also the number of retirement years in people's life spans. "The paradigm for retirement is changing, with many people seeing this new life chapter as a time for both savoring newfound freedom and being strongly engaged with the community. They are feeling a strong need for purpose as they contemplate how to live fulfilling lives in their later years," he remarks. Philosopher Kathleen Dean Moore suggests that elders may have a moral imperative to act on climate change. She writes: "Retired people often feel that, since they've worked all their lives, the world owes them a rest. That's outrageous. Old age is precisely when we need to pay the world back. Yes, we have worked hard, but our successes depended on a stable climate, temperate weather, abundant food, cheap fuel, and a sturdy government -- all advantages that our children and grandchildren will not have if we don't act.... We've got to remember that the next generation will have to live in whatever is left of the world after we get done with it." Throughout human history and in many cultures, elders have insisted on attention to the needs of succeeding generations. Numerous elders groups taking on climate change have recently formed -- many just within the past few years -- and their memberships are growing. Elders Climate Action (ECA) pushes for change in energy policy, advocating for "carbon fee and dividend" legislation and the U.S. Environmental Protection Agency's proposed Clean Power Plan. ECA also supports 350.org's campaign for divestment from fossil fuel stocks. ECA is organizing a national event in Washington, D.C., in September 2015 at which elders will rally and then deliver their message to members of Congress and government agencies. ECA is creating local working groups around the U.S. to continue work on federal as well as local climate legislation. Several organizations have the specific goal of bringing elders' groups together. 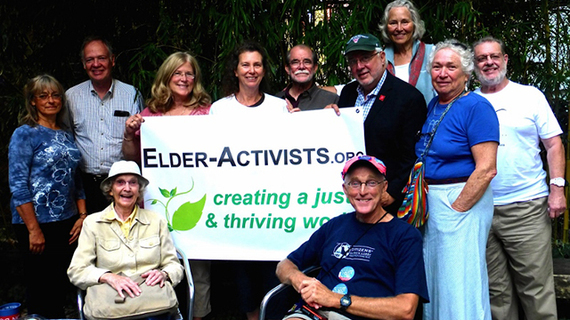 The Conscious Elders Network (CEN) is comprised of action teams that meet together monthly. In addition, CEN is building a web-based network to coordinate and promote other elders groups. The CEN website includes descriptions of elders organizations and a common calendar that lists their courses, retreats, and other events. CEN's Intergenerational Connections action team works to bring elders and youngers together to address critical issues of our time, including climate change, by teaming up and learning from each other. The Conscious Aging Alliance is another growing network of elders organizations. Norwegian Grandparents Climate Campaign at a demonstration in 2012 in front of Parliament. 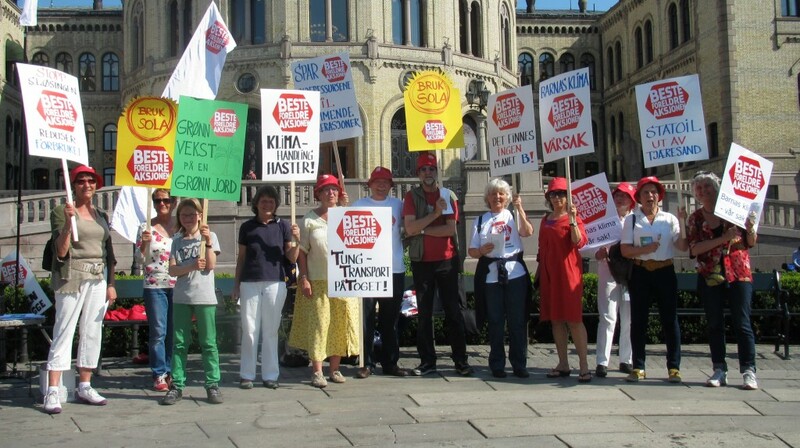 At these monthly events, participants hold signs with messages such as "The Children's Climate - Our Business" and "Statoil Out of Tar Sands," hand out leaflets, and collect petition signatures (http://www.besteforeldreaksjonen.no/). The Elders, an independent group of global leaders chaired by former United Nations Secretary-General Kofi Annan, work together for peace and human rights. They call for visionary leadership to set the world on a course for a carbon-neutral future. This includes a robust, universal, and legally binding agreement on climate change in 2015, in which every country commits to reducing greenhouse gas emissions. The Norwegian Grandparents Climate Change Campaign (NGCC) pushes for Norwegian climate legislation, enforcement of existing laws, cessation of new licenses for drilling in the Arctic, and withdrawal of Statoil (Norway's state-owned oil company) from the tar sands of Alberta, Canada. NGCC participated in the People's Climate March, pushes for divestment from fossil fuels, and works closely with youngers -- for example ECO-Agents, a children's environmental organization. Elders and youngers write joint letters of protest to government officials, go together to Parliament to speak, meet in schools, and attend rallies and march together. The United Kingdom's Grandparents Climate Action lobbies Parliament; participates in rallies and marches for climate action; attends fossil fuel divestment meetings at churches, universities, and local governments; hands out postcards; puts up posters; and edits One Million Climate Jobs booklets for international trade union conferences. Indigenous elders from around the world have been sounding the alarm for some time, and many say they have lost faith in the U.N. climate talks. Climate change is dramatically changing the ecosystems in which many of them live. The Indigenous Elders and Medicine Peoples Council made this formal statement in September 2014 at the United Nations Climate Summit: "We are all responsible and we are all capable of creating a new path forward with new sources of energy that do not harm the people or the Earth. We are obligated to all take action now to protect what is left of the Sacredness of Life. We can no longer wait for solutions from governmental and corporate leaders. We must all take action and responsibility to restore a healthy relationship with each other and Mother Earth. Each of us is put here in this time and this place to personally decide the future of humankind. Did you think the Creator would create unnecessary people in a time of such terrible danger? Know that you yourself are essential to this World. Believe that! Understand both the blessing and the burden of that." The International Council of 13 Indigenous Grandmothers, a "global alliance of prayer, education, and healing for our Mother Earth, all her inhabitants, all the children, and for the next seven generations to come," works on climate change and other issues. Other international and Native American groups and gatherings involving elders working on climate change include Indigenous Peoples' Global Summit on Climate Change 2009, Global Center for Indigenous Leadership and Lifeways, Wisdom of the Elders, First Stewards Inc., Olohana Foundation, and Native Peoples - Native Homelands Climate Change Workshop.